Wakatipu Tiro is the perfect home for groups or families travelling together. With large open plan living and multiple outdoor areas there is plenty of room to entertain. Perched on top of Queenstown Hill, Wakatipu Tiro is positioned perfectly to soak in the sensational views of Lake Wakatipu, The Remarkables Mountain Range and surrounding Mountains. The home is centrally located to all that Queenstown has to offer. On the mid-level is the open plan Kitchen, Living and Dining areas. The modern Kitchen is fully equipped with a large double oven, gas cook top, dishwasher, microwave and all cooking utensils needed. The home has a large dining table as well as outdoor seating so you have plenty of options while enjoying your home cooked meal. Wakatipu Tiro has an electric BBQ to cook on and boasts a Pizza oven for a creative and different dining experience, fun for all ages! 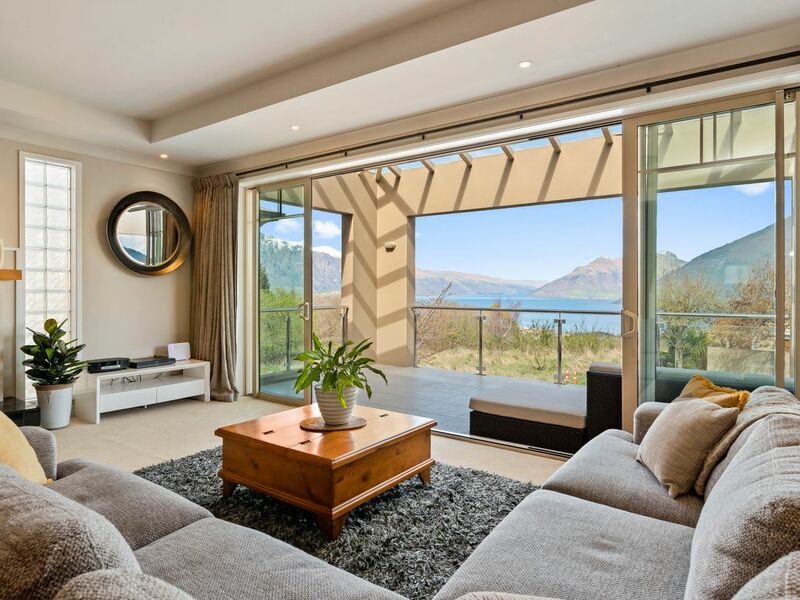 The large living area is great to relax in after a day filled of adventure in Queenstown. Sit down and take a load off while watching the SkyTV, the TV also has Netflix capabilities – you just need your own Netflix account. Keep cosy with the ambiance of the gas fire (there is also two heat pumps and under floor heating throughout the home). Also located on the mid-level are two bedrooms and a family bathroom. One room has a Queen bed and external access to the shared courtyard. A second bedroom with two single beds and a roll-away bed, TV and DVD player is great if you’re travelling with children. This bedroom also has internal access to the family bathroom on the mid-level. The Third floor has the further three bedrooms, family bathroom with a bath and a full laundry.One bedroom has a split King bed and the other has a Queen bed. The master suite has a King bed, walk-through wardrobe and ensuite bathroom. A private balcony is also yours to enjoy and take in the amazing views. Relax in the suite while watching your own TV with SkyTV. This home is split over three levels. Guests under 25 can only check in with a guest 25 years or older. This guest must be on the booking confirmation. Air conditioner for those warmer summer days. Wakatipu Tiro has underfloor heating, gas fire and heat pump for those chillier winter months. Tea, Coffee, Sugar. Salt & Pepper. Property spacious and clean, lots of towels provided, good facilities. Property spacious and clean, lots of towels provided, good facilities. Barbecue in tiny area at back, neighbours was on balcony, more accessible. Could have used some balcony heaters also. Bit of a problem with tiny red spiders in downstairs bedrooms and beds, luckily they didn’t bite. Also a terrible smell of damp when the front door was opened but this was not noticeable once in the living area. Steep hill from town, lovely views. I like walking but not suitable for less mobile.